A few months ago I wrote about my quest to contact my journalism idol, Steve Hartman from CBS News. Through the power of networking, social media, and good old guts, I tracked Steve down via email. That email turned into a phone call. That phone call turned into me teaching a network news correspondent how to use Skype. Seriously. I have the tape to prove it. It’s awesome. My goal through this process was to show my students what’s possible when you go after something you really want. Kind of like tracking down the story. Of course, there were a few life lessons along the way and Steve mentions some of these in our conversation. I’m proud to share with you the interview my students of Ladue View and I conducted last month. It was a thrill of a lifetime for me, and I’m pretty sure my student’s learned quite a bit as well. Enjoy. Don Goble is an award-winning Broadcast, Technology, Multimedia and Film Instructor at Ladue Horton Watkins High School in St. Louis. 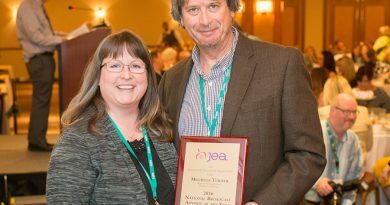 Journalism Education Association's National Broadcast Adviser of the Year in 2015, Don is also an Apple Distinguished Educator, PBS Lead Digital Innovator and author who advocates for media and digital literacy for all learners. Don masterfully engages students to author and craft media messages to build their voice and share their story. I came upon your article because I’m trying to contact Steve Hartman to compliment him on the outstanding work he consistently does for CBS Sunday Morning. I tried the address I found online- stevehartman@cbsnews.com but it came back undeliverable. If you know of the correct one, could you please let me know? As I said, I only wish to tell him how much I love his stories, especially after the one this morning, I can’t hold in my praise, and want him to know how much his work is appreciated. And, if you are choosing him as a mentor then, you have made an exceptional choice and my best wishes to you for a very successful future! I hope you can please help me. Thanks for reading the article and watching the video. Have you tried commenting on one of his stories on Facebook? That’s how I began. Good luck!